Very Durable; Dogs Love It!!! These balls are great! I have them for my dogs and buy several for a local shelter as a Christmas gift. I also give to my friends who have dogs. Dogs love them and they are durable. Good value!!!! My dogs have always loved the Jolly Balls. I have purchased all three sizes depending on how old they are. They are fun and last a long time. Our dog loves his Jolly Ball! This is still holding up 6 months later to my Shepherd's rough gnawing & playing. She was scared of it at first, but definitely gets it out when she's feeling feisty & crazy. I have had two of these balls before and left them at my old residence for some other dogs to enjoy. They lasted for years and even after being punctured they still held their shape. The handledles were a SOLID material. MY current new pup after getting over being terrified of it has now after just a short time eaten most of the handle. The handle is not solid material inside. I am very dissapointed since this was a wonderfull toy and about the only one that my dogs could bot distroy. I hope the company rethinks any cost cutting they may have done and bring back the old quality Jolly Ball. I will buy another one when that happened. As of right now its no different then dozens of other toys that don't last with active dogs. I was a bit unsure how my dog would take to the ball, but he loves it. He figured out that he could chomp down on it and carry it around with him. He spends a lot of time biting it and making the air come out of it and the best part is that it continues to re fill with air, so he can squish the air out of it time and time again. I was worried when he first started biting it, I thought "oh poop, that lasted a whole 5 minutes", but his biting it has no ill effects on the durability of it. Not durable at all. Even our little dog was able to barely bite at the handle and the material almost disintegrated and fell apart. Very disappointed in this product. TOUGH toy - can't be punctured.. I bought one of these for our first pup many years ago, it lasted when nothing else would. We bought one for our current pup who can gnaw through anything, and it stands up to him.. plus he LOVES it.. he carries it by the handle, pushes it around, and tosses it. It is pricy but very much worth it! I had bought these wonderful holy balls for my first border collie many many years ago.. it was wonderful, help up extremely well, very durable, doe she not puncture, and survived being outside year round, We adopted a border collie jack russel mix, and I got him one for his first birthday, he loves it too. I had started him with smaller versions when inside, and got him a large one to enjoy outside. These are so such wonderful and durable toys, they can play with them on their own or with us, I highly recommend for every pup! My pit mix is a heavy chewer and loves fetch. This ball is somewhat weighted and allows him to satisfy various play styles. It started as an indoor toy but he carried it with him and it now spends most of its time in the yard, still in great condition. This is wonderful for rough play, as well as just the average playtime. It's one of my dog's favorite toys, and it's been used almost daily for several months. this is a big hit with our young Airedale. She loves the handle on the ball and runs all over with it. It's good that it has no covering like the "tennis balls" which she tears apart and creates a hazzard. My rottie is OBSESSED with this toy. I had to get more because he will attack it for weeks until it is finally done. He loves how tough these toys are. He can really whip them around and satisfy his desire to bite. I bought 3 so I have more in storage for when he eventually destroys it. I have a year old German shepherd puppy. This ball keeps him occupied for quite awhile. It keeps his attention so he gets more exercise. I have a Chesapeake bay retriever and a shihtzu, these balls are soft but durable! Would recommend highly and will continue to purchase from dog.com they have the best price!!! My shepherd can't be without her jolly ball. She loves the handles so she can carry it around. I know other people say how long they last and I'm sure the last longer for other, but my big girl can go through them. But their still alot better and stronger than other balls out there. Great toy for a rambunctious Border Collie puppy! All time favorite dog ball according to my dogs. First got jolly balls for our horses but soon found that our dogs just loved them...they hold up well are easy to kick or throw and the dogs can retrieve them easily. I usually get the big size for our border collies but we just got a puppy and the big size is too big so got the smaller size for the puppy and the bigger one for our older dog...his last jolly ball lasted 4 yrs...no other ball has lasted as long... after 4 yrs he got the handle chewed off but still plays with it 3 yrs later... I have bought numerous balls, this by far has outlasted the others and has continued to be a favorite even without the handle.. He is thrilled he has the new ball with the handle!!!!! I think the design is great and the materials have lasted really well. Our big border collie is not a small dog he is 83 pounds..and he is a chewer...no squeaky toy has survived more than a week..so 4 years is amazing for him! I don't know if they use a different process for the horse size balls or not but my lab (who is a huge chewer!) stole the horse Jolly Ball from the pasture and she absolute loves it. She brings it around to play fetch and when she gets tired she bites and chews at it so that there are tons of punctures in it. It still has not deflated like a soccer ball would. I love the handle so I can pick it up and get a great toss that goes a long way. She has not been able to chew the handle off or put holes in the ball and it is outside with her to play with all the time. If you like this product and have a bigger dog I would suggest you getting the horse sized Jolly Ball because you will love it!! It's disappointing that they don't make the smaller ones to stand up to chewing. We have some strong chewers (Chesapeake Bay Retrievers) who are happy to chew the toss handle off of this toy. But with or without the handle, they love to fetch it. Even our Coton de Tulear stud likes to chase it. We have the largest size so the Coton can't retrieve it, but he loves it nonetheless. I prefer it in the warm weather than outside in the cold as the plastic is more brittle in cold weather and not as friendly for the thrower - typical for any plastic and not a fault of this toy. My golden retriever chewed the handle off of this in no time. I could still throw it and he could still pick it up, but I think I'll stick to tennis balls...cheaper and aren't destroyed as easily. Not for a dog that is achewer. My dog chewed the handle of in less than 10 minutes. Yes, think of what breed your dog is and how much s/he chews. I like to think of this ball as a toy that we go outside and play with for a while then leave it and go back in. If the dog has this toy all day long and is allowed to chew it endlessly yes it will become destroyed! But we have had our ball for three years now and it's still a treasured toy to the boys! I have a medium sized dog and two small foster dogs, all boys. I took the ball out into the yard and called my dog and tossed it to him. He immediately peed on it and walked away. Then one of the other dogs looked at the ball, sniffed it, and also peed on it. Can't tell if they want to play with it but they both wanted the other dogs to know it was his. Seems like a good toy but I don't think my dogs are interested in it. We have two lab puppies (7 mo. & 9 mo). They immediately chewed through the handle and broke off large pieces of the plastic. We had to take it away from them because we were afraid they would choke on and/or swallow the pieces they were chewing off. I definitely would not recommend this product. Best play yard toy ever! 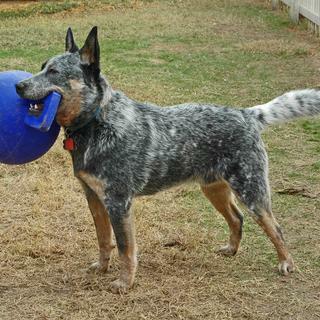 This ball is a favorite among the dogs that like to play tug of war and catch. Best part, this ball is indestructible! My dogs love the Tug N Toss. They sling it side to side by the handle, ram each other, pounce on it and bite into it. I have a Pyrenees/ Hound mix and a great dane/ bully mix and golden/healer mix all tough chewers and this toy endures a lot of chewing and other abuse. This is our third Tug N Toss over a two year period. This is her favorite possession. She loves her ball. She can carry it by the handle or roll it with her legs. She can entertain herself when I am busy or having a rough day. It is an outside toy. She gets very exuberant. Eventually it does have to be replaced. She goes through about one every six months. I had to buy this a second time from Dog.com because we had one before from another vendor but we left it out during the winter which made it easier for my dogs to destroy. My boys love it, chasing after it and bring it back. Great exercise for them. .
Good product but lower price at other sites. Product was much appreciated by our Lab for his B-day but found out after ordering it was priced at a more reduced rate on another site. Again, product excellent, timely delivery, but price eh.... not so much. Great! Durable and dogs love them. I buy Jolly balls for my kennels and the dogs love them. They are very durable and withstand countless play times with the dogs. Our dogs love these but they are not made for aggressive chewers. Our larger dog chewed a hole in the handle the first time he played with it. They love running holding the ball handle in their mouth and chasing each other and tossing the ball at each other. My dog has a lot of fun with this ball. She carries it around by the handle. Bats it around with her paws. She loves to chase it when we throw it. She is a 70 lb Rottweiler.I do not think it would last long if your dog is an aggressive chewer though. For a good time get a Jolly Ball. My 5 month old lab loves this thing. She can't seem to get enough of it and so far it has held up to her daily torture. So far this is very durable, But Frankie is very aggressive so we shall see.. I gave this ball to my daughters dachshund and it lasted 10 minutes before the dog had chewed half of the handle off. I then had to cut off the handle. So the dog carries around the ball by the large opening where the handle was. Will be thrown away. Disappointed. My dogs do like watching how this toy bounces in odd ways and will chase it. Unfortunately they lost interest in bringing it back to me pretty quickly, I don't know if it's the hardness or ??. I will hide it away for a while to see if their interest returns but for now they've moved on to other toys. I have a pit/lab mix who loves this toy! She carries it around all over and chews on the handle. My toy aussie has even been spotted with it in his mouth. Excellent for the bigger dogs. Long lasting, durable and tough for the bigger dogs. It's hard to find a toy tough enough for a rottweiler, lab and Swiss Mountain mix rescue. Our rottie has always liked the Jolly Ball best. He has a medium-sized one that has lasted for two years. This new one is bigger and we hope it will last as long. Strongly recommend. I got this for my 1 year old English bulldog. He has a ball fettish and his mission is to kill and destroy them as fast as possible. It took a couple of days for him to chew a hole in it, but it's not an inflatable ball... it's thick rubber in a ball shape so he still plays with it. I purchased a 2nd one as a back up, as it provides him with energy release and keeps him busy when it's too hot to go outside. Unfortunately my Chocolate Lab chews off the handle within a day. But he still loves to play with them minus the handles. My 7 1/'2 month old Mastiff/Lab/Weimaraner mix who is between 80-85 lbs. had this handle chewed off in about an hour or so (the largest size). The really good thing is that the ball, although mercilessly mauled, still holds it's shape and bouncy quality. Doesn't matter to her that there are holes in it, she still really likes it. I will probably get another as it does keep her occupied. Have already had one of these and it is still being chewed on. You have the best price on the Jolly Tug-n-Toss balls anywhere, even over Amazon. Lots of fun for the dog and almost indestructible. Even when punctured it still holds its shape. LOVE the jolly ball, had them for my border collie years ago he LOVED it, and it was able to handle him, VERY durable! - we have another (wonderful) border collie mix and i am sure he will love one of these too! My Lab loves this ball, but chews off the handle rather quickly. This ball is the FIRST ball I've found that's big enough for my dog, and most importantly won't collapse when bitten into. He loves to carry it around by sinking his teeth into the ball itself .. and was working at chewing off the handle when I let him bring it indoors. So I'm ordering another 8" and the 10". Normally Phinn destroys a ball in under 5 minutes. So far, so good! I have 2 big dogs and they destroy all of their toys so I am hoping this lasts longer than the other toys. Her favorite. She has to have her red ball with he at all times. Have a light blue and dark blue one but she insists on the red one. To keep my dog occupied to play and burn off energy. My dog loves her cousins Jolly ball! Our son's Mastiff loves it, our Pit doesn't care for it too much. Finally, once again, the ball found it's way to recycling bin......but, while it survives my mastiff's mouth, it is wonderful. The balls last a long time for him and are a constant source of activity when we are outside playing. I will continue to buy these wonderful toys. My dog destroys toys in the blink of an eye. This was reviewed as one of the toughest and longest lasting toys out there. Trying to find toys that dogs can't chew. My German Shepherds love these jolly balls! This has been my dog's favorite toy for about 5 years now. My dogs love jolly balls. I bought one of these for my first Lab, and she didn't manage to destroy it, although she did chew a hole in it. It was still something she could play with, had it for years. That was sixteen years ago, she passed last sept. and now we have another lab puppy, had to have one. I forgot what it was called, and found it by accident. Can't wait til it get here. Combination of ball and tug. I think my Airedale will love it. No "tennis ball" covering for her to pull off. Look like a great toy and reviews were good. Jolly pets toys are the only toys my dog doesn't destroy in the first hour that he gets them..
very durable and harder to lose due to it's size. Took a shot and this is the only ball he has ever played with and not shredded into pieces for such a long period of time. Definitely satisfied! Great ball, handle gets chewed off but rest lasts a long time. My one shepherd can't be without these balls. She is crazy about them and again you had a really good price on them. She goes through that many and it makes it hard to afford to keep buying them, well thank you for your sale it really helped me. All the products are favorites of my two German Shepherds. They stand up well to daily play..
My dogs love this ball! Is this ball very durable? BEST ANSWER: The Jolly Ball has lasted 2 years intact with my GSDs. They play with it, carry it around, and push around other toys with it. My mom's GSD chewed the handle off hers, but it doesn't prevent my dogs from playing with it whenever they visit. Between the 3 GSDs we have about 6 Jolly balls and 5 Jolly Eggs- I trust the brand and the dogs enjoy their products. Yes. It is my German Shepherd's favorite toy and I was able to teach him to leave it outside (drops it right before he comes in the doggy door) as he makes a mess of it between the slobber and dirt. He is pretty tough on it and plays with it every day and they still last several months. I highly recommend it. Yes. We bought this for our Rottweiler almost two years ago. It stays out in the yard. It is still intact. She bats it around and pounces on it. We kick it and she retreives it. Also carries it around the yard by the handle. It is not a chew toy but it has held up well. It stays fairly inflated, even after having hundreds of tooth-holes in it. However, some dogs tend to chew the handle off. I let them play with this toy with supervision only. Used to be able to get the large, very-firm (but bite-able) without the handle. Don't they make this anymore? BEST ANSWER: I have only seen the ones with the handle or the ones with the rope. The company (Jolly Pets) has a website /and you can see if they still make the one you used to get. My dog loves his ball with the rope but has eaten the handle on the other. They are good quality toys. My dog weighs 100 pounds and loves to chew so it is nice to get a sturdy ball. I have one with the robe, had since 2007 and this still in great shape and play with in my kennel of Siberian huskies, Samoyed, along with my German shepherd male and german shepherd mix female. it also been ran over with my truck a few times when they lost in pasture grass. they loss to our past landlords horse few times as well. Try the Virtually Indestructible Ball Dog Toy, it does not have a handle and comes in a large size. 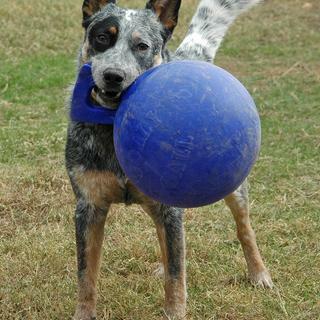 Which size tug and toss ball do you recommend for a dog/puppy over 50 pounds ? BEST ANSWER: This ball is available in the following diameters. Which size Jolly ball is the GSD in the picture holding?